Rolls Royce had a bunch of teething problems with the Trent 900 (for the Airbus 380) which seem to have been largely fixed though they spent at least $300 million to replace faulty engines. Maintenance costs are turning out much higher than anticipated. The Trent 1000 for the Dreamliner however has been plagued by issues through its entire design and testing cycle (and a prototype engine even exploded on its test bed in 2010). Both the Dreamliner and the Trent 1000 took much longer to reach the production stage than anticipated and the development programmes were under severe pressure to fix problems as they occurred. Certainly some long-term issues would have been pushed back to be fixed at a later time (fingers crossed). Two years ago ANA replaced all 100 Rolls Royce Trent 1000 engines on its Dreamliners. At that time it was cracking and corrosion of turbine blades. Now it seems to be “durability issues” in the IP compressor. Rolls-Royce has identified another durability issue in its Trent 1000 series engines, this time involving the intermediate pressure compressor in the Package B version. The variant has flown in service on Boeing 787s since 2012 and consists of 166 engines. The engine company said it has agreed with regulatory authorities to carry out a one-time inspection of the Package B fleet to “further inform” its understanding of the problem. Rolls added that it expects the European Aviation Safety Agency to issue an airworthiness directive in “the coming days,” resulting in “limited impact” on customer operations. The UK aero-engine company said in late May that it would accelerate the development of the permanent fix to the IPC rotor issue on Package C engines and that it had installed a revised compressor blade in an engine scheduled for testing this month. “We aim to have first parts available for engine overhaul in late 2018, rather than 2019 as originally planned,” Rolls-Royce civil aerospace president Chris Cholerton said. Rolls also said it had begun speeding the development of the new blade and a dedicated facility in Derby to build engines on which it will test it. It also developed new on-wing inspection techniques to support airlines in meeting the requirements of the airworthiness directives “as quickly and efficiently as possible,” it said. Cholerton admitted Rolls-Royce expects the number of aircraft affected “to rise in the short term, as the deadline for the completion of initial inspections approaches,” though it remains tight-lipped on the actual numbers. “We are not confirming number of aircraft grounded,” the spokesman said. An in-flight, uncontained, engine failure not only trashes that particular engine, but can also send shrapnel into potentially vulnerable areas of the aircraft (wing fuel tanks for example). The aircraft may still be able to fly without that engine but the effects of shrapnel are potentially lethal. Rolls Royce had its share of teething problems with its Trent 900 engine for the Airbus A380 (Trent 900 failures) and had to spend at least $300 million to replace faulty engines. 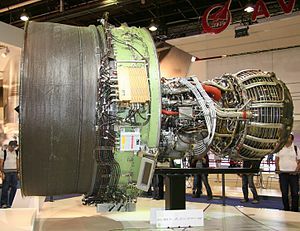 There are only two engines from two manufacturers available for the A380 (Trent 900 from Rolls Royce and the GP7200 from the Engine Alliance – a 50/50 JV between GE and Pratt & Whitney), and competition is limited. Whereas the A380 has 4 turbofan engines, Boeing’s 787 Dreamliner has only two. 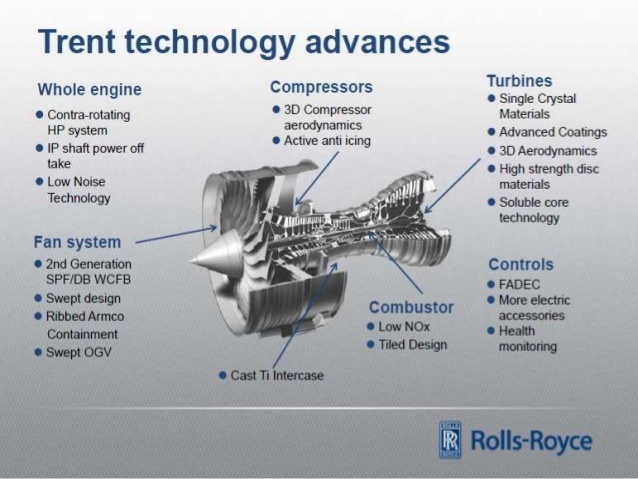 Again competition is limited between Rolls Royce’s Trent 1000 and GE’s GenX. But the Trent 1000 is having erosion/corrosion problems which are causing blades to crack. Blade failure is particularly nasty since the entire engine downstream of the failure can be easily wiped out. Worse, a broken blade or its fragments travel at high speed and can be ejected through the engine casing creating the “uncontained failure”. Vibration induced failures usually show up relatively quickly but corrosion/erosion induced failures can take a few thousand hours of operation to show up. In any event, the Japanese airline ANA has five affected engines but is replacing all 100 engines on its 50 aircraft. The Guardian:The Japanese airline ANA has said it will replace all 100 Rolls-Royce engines on its fleet of Boeing 787 Dreamliners after three engine failures in 2016 caused by corrosion and cracking of turbine blades. The world’s largest 787 operator said all 50 of its 787s would receive engines fitted with new blades, a process that could take up to three years. ANA had five engines that currently needed repairs “but we will replace all the 100 engines for enhanced safety measures”, the company said, adding that it had already repaired three engines. Rolls-Royce said the engine maker would swap existing blades for new ones on ANA’s planes in the short term, and had already started production of a new blade design that would be ready by the end of 2016. ANA and Rolls Royce have not revealed which blade row is affected but it is thought to be due to the flaking of protective coating on the blades of the single stage intermediate pressure turbine. The Trent 1000 is a three-shaft engine with a 2.8m swept-back fan. A single stage LP compressor is followed by an 8-stage IP compressor and a 6-stage HP compressor. The turbine section consists of a single-stage HP, a single-stage IP and a 6-stage LP turbine. Corrosion/erosion is only an issue in the high temperature turbine sections and the HP and IP turbines are most likely to be affected rather than the 6 stages of the LP turbine. Certainly the HP and IP blades would be coated and presumably the bonding between the coating and the blades is an issue causing the coating to flake off and the base metal to be corroded. (Erosion if caused by corrosion products in the IP section could well appear in the downstream LP sections). Faulty coating is more likely to be a manufacturing or a materials issue rather than a design fault. A permanent fix is expected by the end of this year. But Rolls Royce must have supplied some 300 – 400 Trent 1000 engines to the 445 Dreamliners delivered so far. With ANA as the precedent, all will have to be fixed or replaced. So the 2016 RR results will probably be hit by a substantial provision for fixing the issue. With only 2 manufacturers available for the engines for the Airbus A380 and the B787 Dreamliner, the aviation industry needs their products to succeed and compete. Qantas has reached a settlement with engine maker Rolls-Royce over last year’s mid-air disintegration of a the Trent 900 engine, which temporarily forced the grounding of its entire fleet of A380s. The terms of the agreement have not been revealed but will give Qantas a $100 million (A$95 million) boost in profits. For Rolls Royce the cost of the Qantas settlement is therefore likely to be somewhat greater and my guess would be in the region of $110 million. My estimate made in November 2010 that Rolls Royce would face a hit of around $300 million for direct costs and in settlement costs seems to be not far off the mark. The cost to Rolls Royce of loss of future sales remains intangible and perhaps only temporary. Alan Joyce, the Qantas chief executive, said the terms of the agreement are confidential, but said the settlement’s profit and loss impact would amount to a A$95m boost to the Australian airline’s bottom line. Mr Joyce said the settlement marks an end to the legal proceedings Qantas launched against Rolls-Royce in the Federal Court of Australia in December. In November, a Rolls-Royce Trent 900 engine on a Qantas A380 disintegrated shortly after takeoff from Singapore, forcing the plane to make an emergency landing. The Australian Transport Safety Bureau’s interim report on the A380 incident said a manufacturing defect in an oil pipe deep within one of the engines led to an oil leak, which sparked a fire. The fire caused a disintegration of one of the engine’s giant turbine discs, sending pieces of it shooting through the plane’s wing and raining onto the ground below. The engine explosion was the most significant safety issue an A380 had ever faced since it began passenger flights in 2007, and prompted intense scrutiny of Rolls-Royce engines. The settlement will help Qantas recover from the millions it lost following the incident. The airline was forced to temporarily ground its entire fleet of A380s for a series of inspections, and Joyce said the plane damaged by the explosion won’t return to service until February. The compensation payment helped boost the airline’s expected underlying pretax profit for the year to June 30 to between A$500 million (£326m) and A$550 million (£359m), up from A$377 million (£246m) a year ago. …… Qantas shares rose 0.8 per cent to AU$1.84 in afternoon trading. This leaves Rolls Royce the task of settling with Airbus and some less costly settlements with Lufthansa and Singapore Airlines. My estimate is that it will take another 2 to 3 quarters for most of these costs to have worked their way through Rolls Royce’s accounts. However RR will have to bear an increased and continuing service cost regime for some time to come for the Trent 900. The Trent 1000 for the Dreamliner is still a long way off from generating real revenues for Rolls Royce. It could be time to buy Rolls Royce again. In the first half of 2010 Rolls Royce had revenues of £5.421 billion with a PBT of £465 million (8.6%) of revenues. Cash position was strong with net cash for the period at £915 million. But it looks less impressive considering the order backlog of £58.4 billion. How much of the net cash was due to order down-payments is not clear. Orders received during the period were £5.9 billion (and backlog was virtually unchanged) and this would have provided net cash of around £550 million. So operating cash flow (excluding financial posts) was probably only £350 million. The Trent 900 debacle will probably eat up at least £200 million – and perhaps more – over the next 12 -18 months. The immediate effect will also be the loss of some expected orders and 22 A380s – bought by Qatar Airways, Kingfisher, Etihad and Air Austral – are yet to decide whether to use the Trent 900 or the rival GP7200 made by the GE / Pratt & Whitney Alliance. Any loss of market share will be difficult to recover. To sell the 100 additional engines that will be needed to recover the costs of this fix will take a few years. Even though all the costs will not be incurred in this quarter, some significant provision will have to be made this year (and it will be a real warning sign if such provision is not made). The financial and technological position of Rolls Royce is strong and they should be able to make the fix and weather the storm. But profits will be hit hard for at least the next 12 months and perhaps even longer if Trent 900 sales suffer or if the Trent 1000 is further delayed. Until the Trent 1000 is established in the Dreamliner (which depends on the Boeing 787 coming into service through next year), Rolls Royce share value is capped and with a big downside. It is perhaps time to sell and it could be time to re-enter in about 12 months if some of the major uncertainties are resolved by then. Rolls-Royce, beset by criticism over its public handling of the uncontained failures of its Trent 900 and 1000 engines, has canceled its planned Airshow China show briefing. The engine-maker offered no explanation for the cancellation, leaving media attending the show only to speculate on its sudden change of plans. 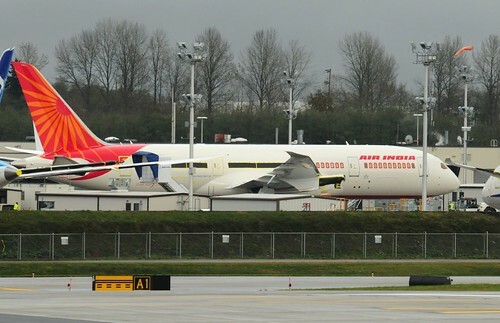 Air India‘s first 787 Dreamliner, registered VT-ANA, has been moved from the paint hangar to the Everett flight line. Airplane 25 is slated for a second quarter 2011 delivery to the Indian flag carrier. 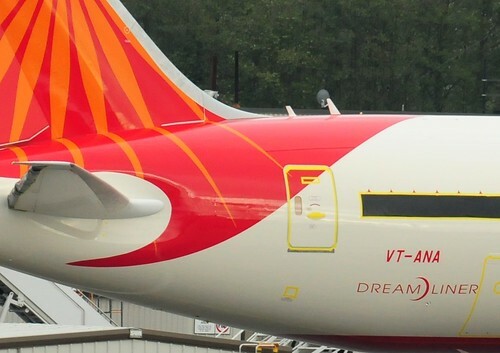 Air India has 27 Dreamliners on order. The ICAO, a United Nations agency based in Montreal, was established in 1944 to draw up international regulations and standards for air travel. It is responsible for assigning the codes for airlines, airports and individual aircraft used by air traffic controllers across the world. It assigned the code VT to British India in 1944, three years before the country was divided into the independent states of India and Pakistan. India kept VT, while Pakistan was assigned AP. Britain now uses G. Several other former British colonies and territories still use codes that begin with V, such as Australia (VH), Antigua and Bermuda (V2), and the Falkland Islands (VP-F). Others have changed theirs, such as Fiji, which now uses DQ, and Kenya, which uses 5Y. The black plasic on the windows is for storage. Air India will be using General Electric GEnx engines (and the Rolls Royce Trent 1000 is the only other engine available for the Dreamliner). It seems that Rolls Royce are facing issues with three different engines; the Trent 900 for the A380s, the RB211-524s having Trent features and the Trent 1000. Singapore Airlines are grounding three of their A380s for engine change-outs as a precautionary measure. Singapore Airlines (SIA) said Wednesday it had grounded three Airbus A380 planes to carry out “precautionary” engine changes following a mid-air engine failure on a Qantas-operated superjumbo. “Based on further analysis of inspection findings as the investigation into last week’s incident involving another operator’s Airbus A380 is progressing, Singapore Airlines will be carrying out precautionary engine changes on three A380s,” the carrier said in a statement. An SIA spokeswoman told AFP that Rolls Royce had advised the carrier to change the engines after tests showed oil stains on them. “We were advised by Rolls-Royce in particular that these three engines had signs of oil stains,” she said, stressing the issue was different from the problem that affected the Qantas A380 plane last week. The three planes are now in London, Sydney and Melbourne pending the engine changes, and SIA could not confirm the duration of their grounding nor the cost of replacing the engines. My simplistic view of what is certainly a very complicated picture is that there are certain operating conditions at which the Trent 900 is subject to oil leaks (possibly because some oil carrying pipes are susceptible to vibration based cracks). These operating conditions are probably when the Trent 900 is being “pushed” close to maximum thrust conditions and Qantas’ method of operation has these engines operating at these conditions for more of the time than other airlines. This mode of operation probably occurs more often at or soon after take-off. Even though Rolls Royce has said that the issues with the Trent 1000 are entirely different and have been fixed, there remains the issue of whether the Trent based improvements when introduced into the RB211-524 engine also creates a “dangerous” operating zone. with the Trent 1000 for the Boeing Dreamliner where some issues have been fixed but where delays are still in the air. I have no doubt that they are going to get fixed but the direct cost will be high and my guess is that Rolls Royce will have to bear the brunt of the cost with some costs incurred by Qantas for their own fleet. It will need the sale of many Trent 900s before Rolls Royce can amortise all the development and “teething” costs for this engine. It is of some small comfort that the number of engines to be “fixed in the field” is relatively small. The costs for Airbus will be mainly indirect for the loss of reputation and for some lost opportunities. But the A 380’s ability to land safely even after one wing was heavily damaged is not unimpressive. New suggestions have emerged that a spectacular engine failure near Singapore last week caused more damage to the plane involved than first thought. The No 2 engine’s violent disintegration ripped a hole through the Airbus A380’s left wing, destroying wiring that prevented the pilots from turning off the No 1 engine and causing a fuel leak. Suggestions have now emerged that there was also significant damage to hydraulic systems that prevented spoilers, panels on the wing that create drag to slow the plane down, from deploying. 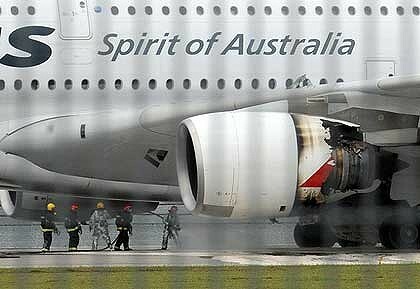 The wrecked engine after the plane landed in Singapore. The suggestions came as the Australian Transport Safety Bureau yesterday interviewed the flight crew of the stricken A380 and performed the first boroscope inspection of the Rolls-Royce Trent 900 engine. Investigators are continuing their search for the rest of a turbine disc that broke up in the incident and have set up a schedule for examining a recovered piece that has been sent to Britain for forensic tests. Inspections of the grounded planes continued yesterday amid suggestions European regulators were poised to issue an airworthiness directive on the checks. With this amount of damage to the wing it is a tribute to the pilots and to the Airbus A380 aircraft that the landing in Singapore was as smooth as it was and with no injuries at all. Rolls Royce has said that the issues are specific to the Trent 900 and there are further indications that the issues may be specific to the engines as used by Qantas. The engine maker added that it would provide a further update on the investigation with its interim management statement on November 12. It seems that Rolls Royce are honing in on the A380 problem which seems to be specific to the Trent 900 engine (and perhaps just the Qantas Trent 900 engines) and unconnected with the earlier test bed incident on a Trent 1000. The share sell-off which continued on Monday morning was halted and the share price had recovered somewhat by the end of the trading day in London. Rolls-Royce is to carry out a series of checks on Airbuses powered by its Trent 900 engine following an engine failure on a Qantas flight last week. Rolls-Royce said it had made progress on the cause of the failure and it was now clear the incident was specific to the Trent 900 engine. It said: “As a result, a series of checks and inspections has been agreed with Airbus, with operators of the Trent 900 powered A380 and with the airworthiness authorities. It said the Trent 900 incident was the first of its kind to occur on a large civil Rolls-Royce engine since 1994. Since then Rolls-Royce has accumulated 142 million hours of flight on Trent and RB211 engines. Over 25 million shares were sold on Thursday and Friday as Rolls Royce shares plummetted from 654p to 591p as their problems with the Trent 900 engines for the Airbus A380 and with the RB211-524 engines for the Boeing 747 became apparent. Further delays of the Boeing Dreamliner which is to use the RR Trent 1000 engines were reported causing speculation that some of these delays were due to delays with the engine. Boeing Co. has told several of its early customers that delivery of the 787 Dreamliner will be delayed by as long as 10 months, Aviation Week reported Friday, citing industry sources. Korean Air will receive its first 787 in August 2012, 10 months later than planned. Air India, previously slated to receive the plane in April 2011, will get it in September or October of that year. Boeing has said it intends to make the first delivery of the plane to All Nippon Airways in the middle of the 2011’s first quarter, according to reports. Aviation news website FlightGlobal.com reported Thursday that Japan Airlines Corp. had expected to receive its first 787 delivery in March 2011, will now get the plane in June 2011. Trent 900 vs. GP7200: Competitive pressures getting too hot? "Carbon dioxide involved but not determinative in 100,000 year glacial cycles"